My mouth is watering just writing about making this spinachy goodness! Tip into a colander and let it cool. Step 2 In a blender, hand-held blender or food processor, blend together the peanut butter, tahini, rice vinegar, soy sauce, sugar and a bit of the water (add more if needed for a pourable, but thick consistency). Taste. Adjust. 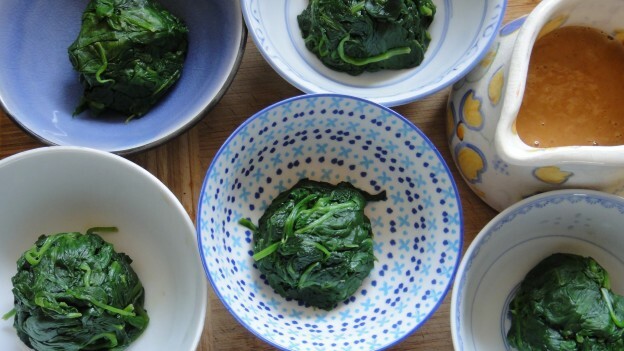 Keep at room temperature until your spinach is ready to wear the glorious sauce. Drain. Drain. Squish and drain. Use a colander, time and your hands. Get squishy with it. Trust me…you'll want this to be as un-watery as possible. Then form it into balls about the size of an orange and set them in little bowls. I love little bowls! Pop them into the fridge to set for about 30-60 minutes. Step 4 Pour over the sauce and top with the toasted sesame seeds. Devour. You can most certainly try to eat this with chopsticks, but I bet you can't get it in your mouth fast enough…just fork it! *I forgot to take a photo the last time...I was too busy inhaling the gomae. I'll add one some other time. Nutrition information - click on image to enlarge. This entry was posted in appetizers, Dips, dressings + sauces, Food, home + garden and tagged brown sugar, cold salad, Japanese, Japanese spinach salad, peanut butter, rice vinegar, sesame seeds, spinach, spinach goma-ae, Spinach gomae on 5 September 2015 by peas. Miso Hungry Gravy - A taste-worthy, creamy gravy that even non-vegetarians love! This is my go-to substitute for gravy in any recipe or meal. Step 1 Melt butter on low to medium heat. Step 2 Chop onion. Later, we'll blend everything, so it doesn't matter the size here unless you don't have an immersion blender. If you do not have one, then mince the onions. Add to butter, let cook for about three minutes or less, then add the garlic (also minced, if you're not using an immersion blender). Cook until the onion is translucent. Do not let the onion and garlic brown. Step 3 Add flour, whisk or stir. Cook for another minute. Step 4 Add veg stock, miso and soy sauce. Bring to low boil. Turn heat to simmer. Step 5 Add nutritional yeast flakes, (salt) + pepper and taste. Stir and adjust as necessary. Step 6 If the gravy is not thick enough for you, whisk together the cornstarch and hot water in separate bowl: add a bit at a time to the gravy and stir until desired consistency. Step 7 If you have an immersion blender, whir up the gravy. Taste again and adjust flavour. Nutrition information. Click on the image and it will be easier to read. Magic. 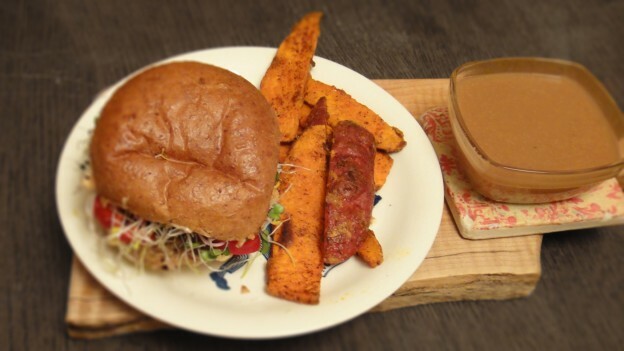 Miso Hungry Gravy pictured here with Sweet Potato Fries and a homemade veggie burger (recipe to come soon). 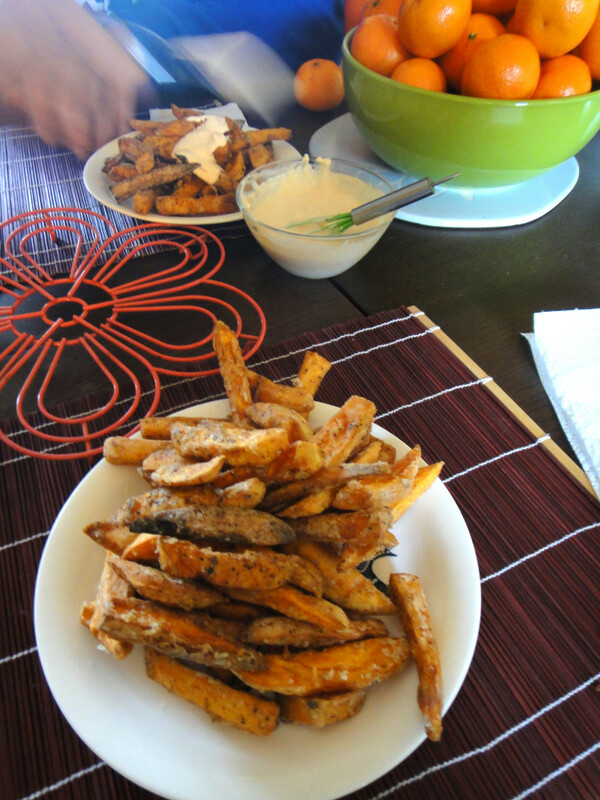 This entry was posted in Dips, dressings + sauces, Food, home + garden and tagged cornstarch, dip, garlic, gluten-free, gravy, miso, nutritional yeast, onions, soy sauce, vegan, vegan gravy, vegetarian, vegetarian gravy on 5 September 2015 by peas. This is a slightly different version of this recipe. 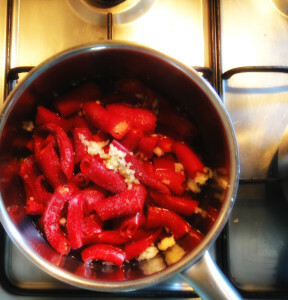 I've added more peppers and garlic and offer alternative puree methods. It is easier to buy it, I know. But I can't get it here in the Netherlands. I have received numerous care packages from home containing –among other Canadian delights– bottles of Frank's. Then, my super, awesome friend started supplying me from the UK. Thanks everyone! Demand over supply had me always trying to find replacements and then I stumbled upon a recipe (above) and have now perfected it. Wash and cut stems from the cayenne peppers. Cut off the tips too, if they're gnarly; otherwise, toss them in too! Step 3 Roughly chop the garlic in a blender or by hand. Add everything to a pot and let it come to a light boil, then reduce heat enough to keep a slight boil. Continue cooking (and salivating) for about 30 minutes. Stir occasionally. 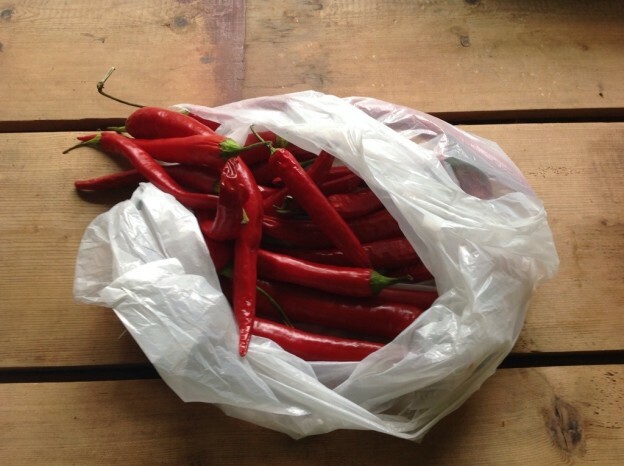 The pepper flesh should be softer. Then, it blends easier. Step 5 Remove from heat. 1) Whir it all up with an immersion blender until you have a fairly smooth mixture. 2) Allow mixture to cool...and I don't mean cool-to-warm, I mean no heat. Pour into the blender and whir it up until you have a fairly smooth mixture. Do NOT try to puree in the blender while the mixture is still hot/warm. 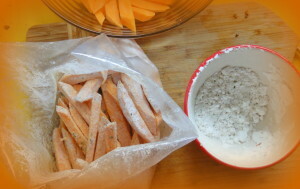 The steam created within the blender will pop the top off once the blender starts. And then...mayhem and possibly pain. Step 7 Return mixture to the pot and simmer for about 15-20 minutes. 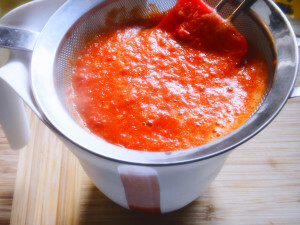 Strain through a fine-mesh sieve and mash the mixture to get the most sauce out. Don't waste a precious drop! Let it cool and then pour into a bottle. Store in the fridge. I believe it will keep for several weeks, but we use it so fast I have no idea how long it will last. Now, what do YOU put hot sauce on? 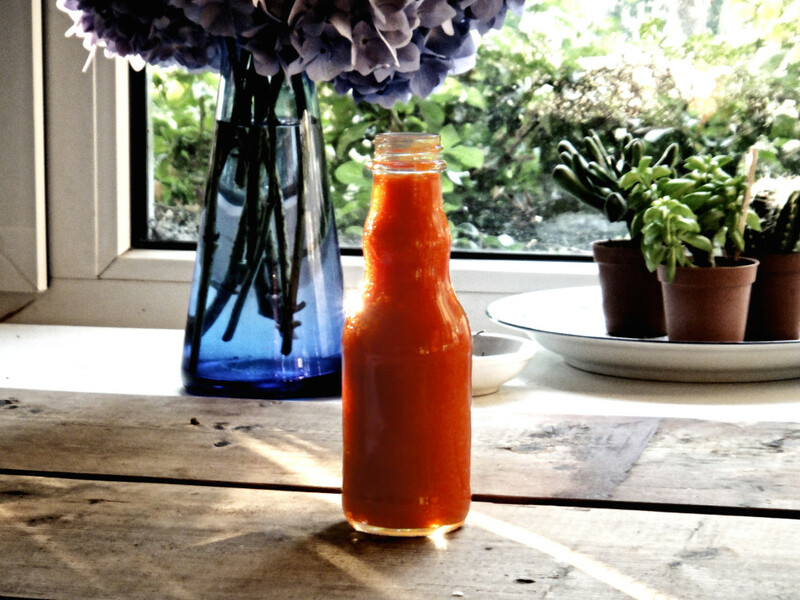 This entry was posted in Dips, dressings + sauces, Food, home + garden and tagged cayenne peppers, Frank's original hot sauce, garlic, homemade hot sauce, vinegar on 24 June 2014 by peas. Once again, I haven't really measured anything, but here is my hapless recipe for delicious arugula pesto that you can use with pasts, on sandwiches or as a dip. If you want to use less oil, add warm water to replace some of the oil (but not all of it). Step 1 Toast the pine nuts in the oven or in a pan. Be careful not to let them burn! Let them cool down. Step 2 Roughly chop the garlic in the food processor. Step 3 Add the other ingredients to the food processor, except for the oliveoil, just add a bit for now to give the pesto some moisture. Drizzle the olive oil into the food processor as it mixes the pesto and check the consistency. Add more olive oil as needed. Step 5 Salt and pepper to taste. Step 6 On the first day, I used the pesto with some mushroom-filled ravioli. On the second day, I used in in veggie wraps. 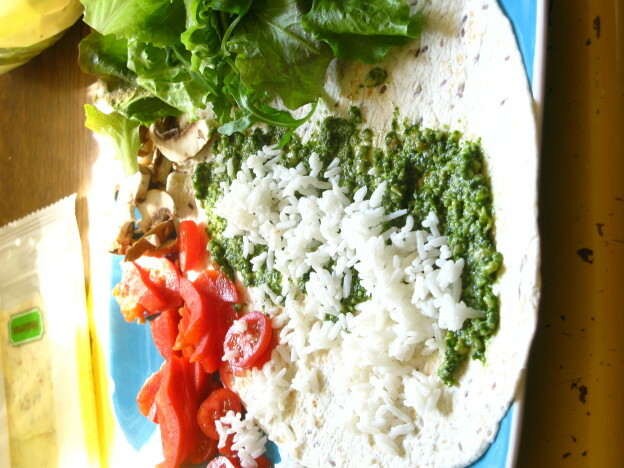 The wrap pictured contains arugula pesto, leftover rice, leafy greens, red pepper, cherry tomatoes, brown mushrooms and cheese. This post used to be called Arugula Pesto, but since I’ve added so many variations…I changed the title. *Replace the parm with nutritional yeast or other suitable substitute to make these vegan. 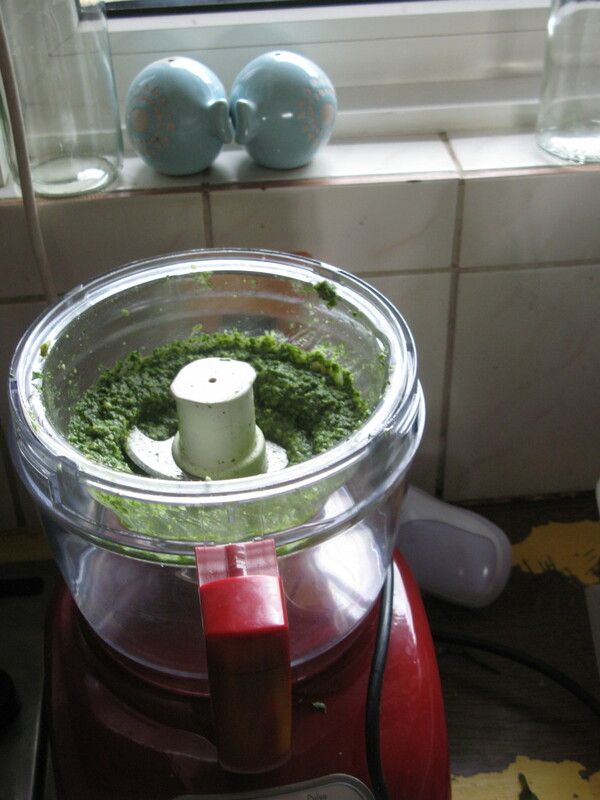 This entry was posted in Dips, dressings + sauces, Food, home + garden and tagged arugula, dip, garlic, olive oil, parmesan, pasta, pesto, pine nuts, rocket, rucola, spread on 19 April 2014 by peas. 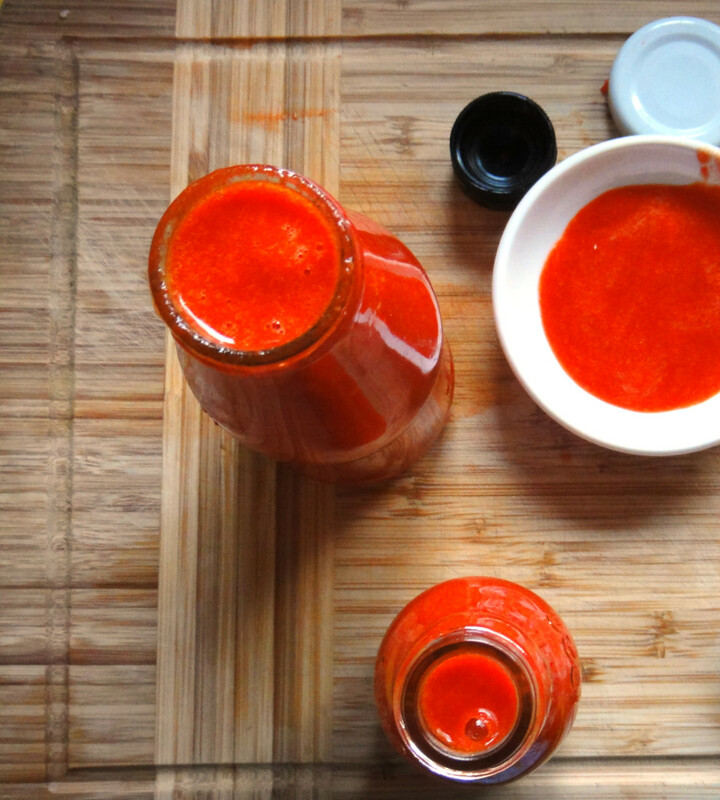 This incredible dressing and dip can go on or with pretty much anything. Half or quarter the recipe for less, but I bet you'll wish you didn't! We use this dressing on all kinds of salads and it is also delicious as a dip. You can drizzle it on a falafel sandwich, dip some spanikopita in it, dress a fresh spinach salad with it or add it to a rice /veggie bowl! 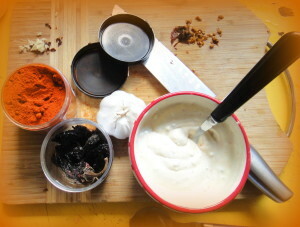 Step 1 Add all ingredients to a blender, hand blender or food processor. Step 2 Mix until smooth...remember you have green onion and garlic in there! Step 3 Taste. Add water/vinegar/lemon juice or soy sauce if it's too thick or to perk up the flavour. Add more tahini if it's too thin...but only a bit at a time. 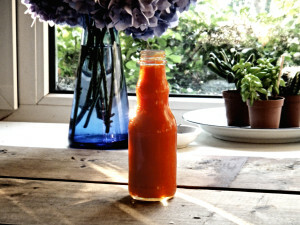 Step 4 Pour into mason jars or recycled salad dressing bottles and store in the fridge. 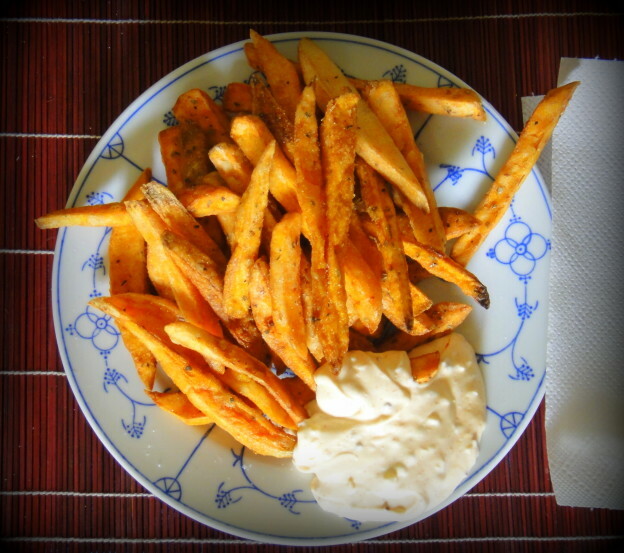 This entry was posted in Dips, dressings + sauces, Food, home + garden on 27 February 2014 by peas.